Pin me 👆🏽 to save me for later! Trust me, I’m not 100% natural, all the time. If I get a gnarly headache and can’t nip it with some serious hydration or peppermint essential oil, then I’ll definitely take some pain relief as a last resort. Sometimes you gotta do what you gotta do! I can’t always nap it out or try again tomorrow. BUT when it comes to colds and flu, I prefer to stick with natural remedies than reach for over-the-counter medication. 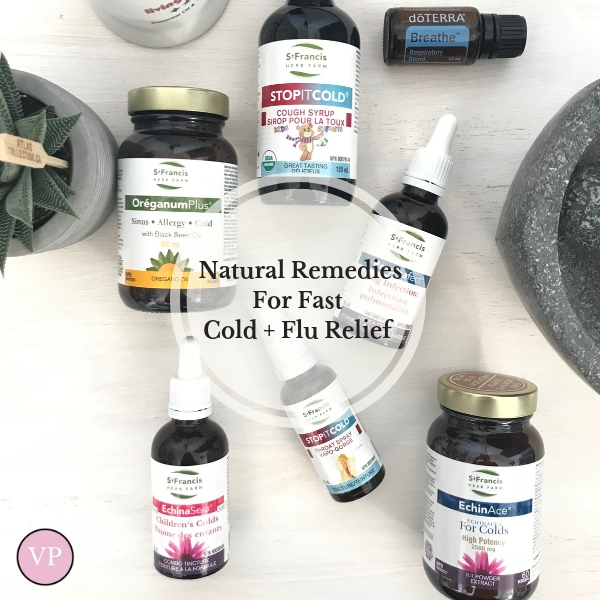 Natural remedies are really quite effective at not only providing relief from your symptoms but also shortening the duration of your cold and flu. They also work to strengthen your immune system which is a huge bonus! Remember, at the point that you’re already sick, your body is really asking you to slow down, take extra care and REST. You’re serving no one by pushing yourself and ignoring your symptoms. So once you’re sick, set yourself up on the couch or in your bed, put on some thick/cozy socks, grab a heavy blanket, make sure you have a hydration station going (remember, plenty of fluids! ), line up your fav series to watch (again) on Netflix, don’t forget the tissue box and keep the following remedies close by. Oregano Oil. The king of cold and flu supplements IMO. This is the first supplement that I reach for at any whisper of a cold or flu bug coming on. Why? Because it’s so well known for its antimicrobial effect. It’s truly powerful stuff. Oil of oregano is antiviral, antibacterial and anti-fungal. Hands down, this is one supplement you MUST have in your cupboard. Oregano oil comes in a dropper bottle (liquid form, if you can handle the strong taste) or you can buy these convenient gel caps (pictured above). Both work VERY well. EchinAce (high potency echinacea). After reaching for my oil of oregano, this is what I reach for next! Not only do I take this high potency echinacea at the first sign of a cold but I also take it preventatively. If I’m around anyone who’s sick or I go someplace where I’m around a lot of people and exposed to germs, then I definitely dose up with this stuff as a precautionary measure. In a 2016 research study, echinacea was demonstrated to not only prevent the common cold but also shorten its duration and reduce cold episodes requiring additional medication. Respirafect. This is a fantastic infection-fighting supplement if you’ve come down with anything respiratory: chest complaints, excess mucus, coughs and bronchitis. It’s formulated with specific herbs known to address lung and bronchial infections. It will help sooth the lungs as well as expel any excess mucus. Stop It Cold throat spray. One of the first tell tale symptoms for me when I’m getting sick is a sticky, sore throat! Every time! I use this throat spray along with the oil of oregano and EchinAce to try to nip whatever is working its way in. If I’m unsuccessful and I do get a cold or flu, this spray is amazing for soothing sore throats, coughs and any mouth or throat infection. Don’t have this particular spray? You can also use bee propolis throat spray which works just as well. It’s antiviral and antibacterial and really wonderful for sore throats and coughs. In fact, even a spoonful of raw honey will often do the trick for soothing a sore throat. Kids formulas: There are 2 I recommend for treating cold and flu: 1. The Stop It Cold Kids Cough Syrup which has amazing powerhouse ingredients like Elderberry (anti-inflammatory and an antioxidant), Wild Cherry Bark, essential oils and a little honey - so kids will love the taste. 2. EchinaSera which helps to alleviate symptoms as well as shorten the duration of the common cold. It also has very a very low alcohol content and tastes great (so they won’t complain). doTERRA’s Breathe blend. Don’t have it? You can easily use eucalyptus essential oil. This stuff is gold if you have a stuffy nose or sinus infection and can’t breathe. I diffuse it into the air using an ultrasonic diffuser, I also dilute a drop or two in a carrier oil and rub it on my chest as well as just under my nose (as long as it’s not raw and red, otherwise this will burn) and I’ll even put a few drops on a tissue and just continue to breathe it in as needed. HYDRATION. It’s crucial to get 2-3L in everyday BUT even more important when you’re sick. Have you ever noticed that when you see your medical doctor for a cold or flu bug, they send you home and tell you to rest and get plenty of fluids! There’s a reason. Water helps flush your system of toxins but it also helps replenish what’s lost from fever and respiratory tract evaporation. Lastly, it works to loosen mucus and phlegm so that you can clear it from your airway more easily. When we’re dehydrated, symptoms of cold and flu can be exacerbated such as nausea and vomiting. This is why it’s imperative that you replenish and hydrate. Some great options include, plain ol’ water, herbal teas, warm water with lemon, ginger and raw honey, bone broths, soups and green juices. There you have it! My top natural remedies for fast relief from cold & flu. More than anything, when you’re sick, your body needs REST. Sleep is the time when your body heals and repairs itself. Your immune system relies on it to stay healthy. So, please don’t underestimate the value of sleep. Now, I wanna know! What are your go to cold and flu remedies? Commend below! Get more each week by joining the newsletter & get access to my FREE resource library. I hate spam and promise to treat your email with respect.